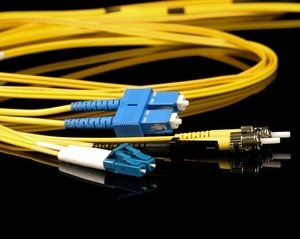 Singlemode fiber optic patch cables come with a 9 micron diameter glass core. With the cladding layer, they are 125 micron, and with the buffer layer they are 250 micron. To prevent excessive loss (attenuation), you should ensure that you only connect singlemode cables to other singlemode fibers already in your system. The PVC jacket of the singlemode fiber is normally yellow (although we can make them in other colors) and is 3.0mm in diameter for ST, SC, and FC connectors, but 2.0mm if the cable has an LC or MTRJ connector. We can also make these cables with a plenum jacket or a LSZH (Low Smoke Zero Halogen) jacket, if required. Singlemode cables have a smaller glass core than multimode cables and because there is less dispersion of the light signal in the fiber, they can transmit the signal a greater distance. To get this more precise light signal, the transmitters and receivers used at each end of the fiber are typically more expensive than those for multimode fiber. The signals used in multimode fiber are usually 1310nm and 1550nm wavelengths. In Wave Division Multiplexing (WDM), additional wavelengths may be used. Singlemode fibers can typically carry a data signal from 5km to over 100km, depending upon the speed. The term “singlemode” refers to the fact that the light takes a single path (mode) through the glass fiber core, as opposed to “multimode” where the light takes multiple paths through the fiber.